Trying out roofing options yourself before you contact a roofer is a great way to narrow down the roofing options you want, without the pressure of having decide by the end of the day. Traditionally, you would have to pore through roofing samples, color swatches and drawings to do this. But thanks to GAF, this important process has become much easier. What Is the GAF Virtual Home Remodeler? 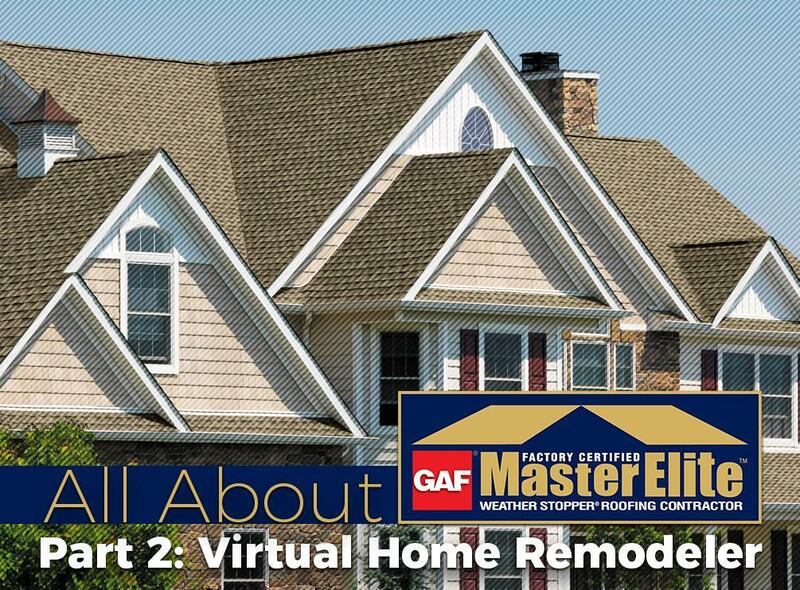 The GAF Virtual Home Remodeler is a free online tool that lets you virtually install GAF roofing products, mix and match them with siding and trim options and come up with the right roofing combination for your home. It doesn’t require apps to install, nor do you need advanced computer skills to use it. If you can visit our website, then you’re good to go. Upon visiting the GAF Virtual Home Remodeler page, you can try it immediately by clicking on Start Designing. GAF has uploaded stock images so you can get your feet wet and get the hang of using the Virtual Home Remodeler. Or you can virtually try it on your own roofing system and start uploading your own photos by clicking on Upload Your Own option. To save your designs for later, we recommend creating a free GAF account, simply click on Sign In, then Register. We recommend taking photos of every side of your home on a clear day. After uploading, you will need to “teach” the Virtual Home Remodeler which parts of the photo are your roof, siding, doors, and windows. It may sound like a lot of work, but you will only need to do this once for each photo. After that, you can take all the time you need to select roofing options from the right hand menu and virtually “install” it on your home. Once you have made your selections—you can save more than one—save them through your free GAF account. Alternatively, you can save the image on your computer, print it, or share it with your friends via your Facebook and Twitter accounts. And when you’re ready to have one of these designs installed on your roof, the image will include a list of all the exact materials for the project, so there wouldn’t be any guesswork when it’s time to consult with a GAF Master Elite™ contractor. To learn more about what we can do for your roofs and gutters, call Innovative Roofing and Siding, Inc. today at (865) 444-6070 or fill out our contact form to schedule a free no-obligation quote. We serve Maryville, TN and nearby areas.